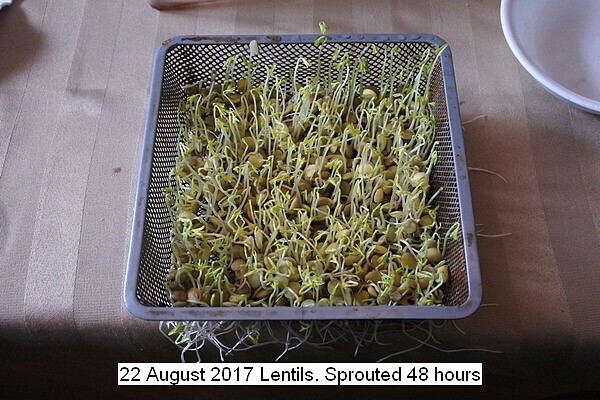 After experimenting with various sprouts over time, it was decided to settle on lentils as a daily fresh diet addition. Lentils spout easily in 48 hours and are low cost and readily available. Half a cup of lentils are immersed in water and left to soak for 24 hours. then they are placed in a screen container and allowed to sprout for 48 hours. Any amount of sprouting is acceptable. Two batches are processed 24 hours apart simultaneously to insure a daily supply. The sprouted lentils are then mixed with various juices and blend3d into a liquid for consumption as required. Pictures depict the process.